Belly bars, belly rings, tongue bars, body jewellery and sterling silver belly button jewellery from Bellybar.Co.Uk. The UK's best collection of beautifully made 925 Silver, Surgical steel and Titanium belly bars. 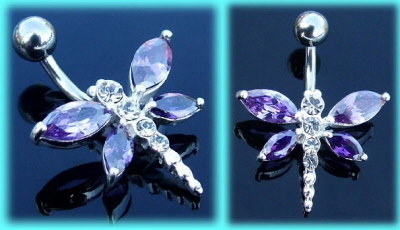 This surgical steel belly bar features a sterling silver dragonfly design which is set with clear and amethyst colour stones. These belly bars are available in a 8mm or 10mm size. ShopFactory shopping cart software powers Belly Bars from bellybar.co.uk. All-in one eCommerce software and shopping cart.